Much has been written lately about the lack of reporting of serious and outrageous world events. This is seemingly not a new phenomenon, however, as The Promise demonstrates. Dealing with the Armenian genocide that occurred in the early 20th Century, as the Ottoman Empire neared its end, this is a period in history that is rarely reported, and frequently denied or re-categorised. That’s why it’s surprising that an opportunity to document something that has been woefully under-reported, has been diluted by hanging it on a fictional love-triangle. Isaac plays Mikel, an aspiring doctor, who leaves his small Armenian village to study medicine in Constantinople. While there, he meets Ana (Le Bon), an Armenian woman raised in Paris. Although he is smitten with her, she is living with an American journalist Chris (Bale) so he is forced to settle for friendship. However, as tensions begin to rise with the imminent outbreak of World War I, Armenians are persecuted, pushing the two closer. As war breaks out, Mikel finds himself in a forced labour-camp, desperate to get back to his family. However, with Armenians being massacred daily, the world he will return to is not that which he left, and the ongoing persecution will see those who manage to survive flee the country for a new life elsewhere. As you can probably gather from the synopsis, there is a lot of focus on the love-triangle here, and the massacre of the Armenians almost feels like a catalyst for it, much like the sinking of the Titanic was a catalyst for Jack and Rose’s love story. For many people this may not be a bad thing, as there are so many political machinations behind the events depicted, that the mind would boggle trying to understand them. However, it does sometimes detract from what is a very serious story, and at times The Promise becomes almost just another war romance. When facts and figures are presented at the end of the movie, as is the way with these sorts of ‘fact-based’ tales, it feels like they spent the entire two-hour running time skirting around the love-triangle, to build up to the last 20 odd minutes, where several thousand Armenians manage to escape. The Promise is beautifully shot, and there are some excellent performances, especially from Issac, but it is too long and it drags badly in places. You could easily shave half an hour off this without affecting the crux of the story. In trying to be both a love story and a serious factual drama, The Promise ends up blurring its own lines, and always feels somewhat lacking. Although this is insightful, and at times entertaining, I couldn’t help but feel that I went away not knowing too much more about the Armenian genocide than I did when I went in, so in terms of educating an audience, The Promise fails. 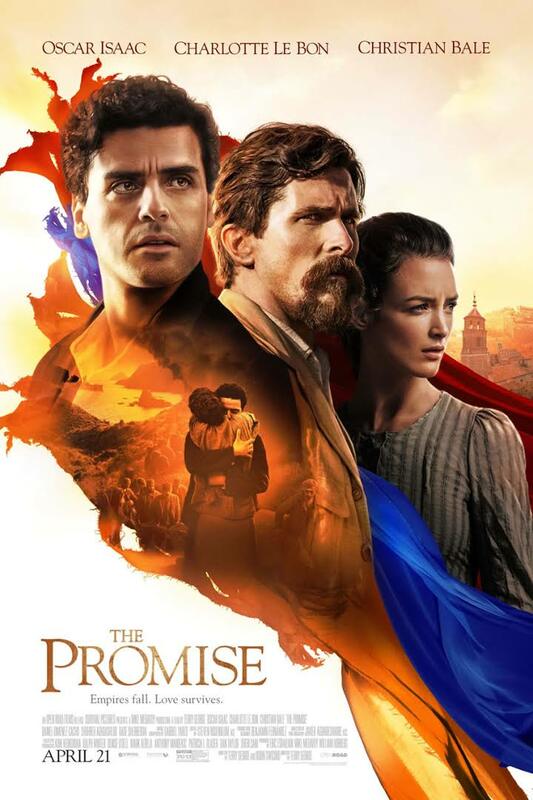 However, if you are looking for an antidote to a certain big blockbuster superhero movie, and you don’t mind your serious war movies having a touch of romantic drama, then you’ll enjoy The Promise.